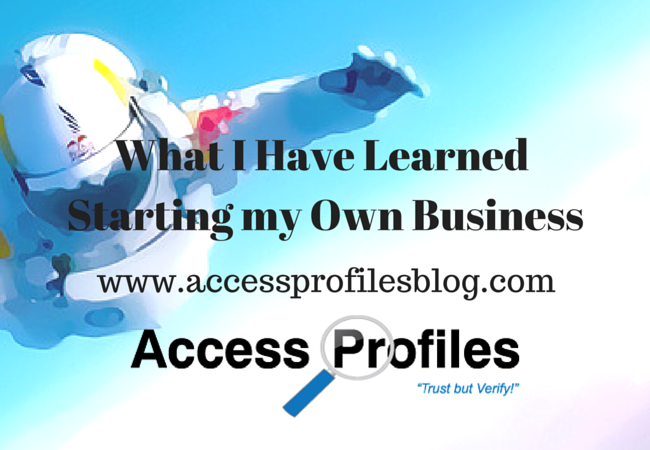 Access Profiles, Inc.: What I Have Learned by Starting My Own Business! Yes, I knew it would be a lot of work but, at the time, I was more focused on finding a way to make money while my children were still young and in school. My husband’s job was very time consuming. He was rarely able to get home early enough to attend the various games our children participated in or to even pick them up from an after-school practice. Forget about being able to volunteer for a party or to chaperone a field trip. And I wanted to do those things. in my own small business? I could volunteer, see all my kid’s games, and earn a paycheck! It would be perfect! Are any of you laughing yet? I, along with two partners, incorporated our business in 1996. We decided on a Background Check Services company. We all brought various skills to the table and jumped right in. We filled out and filed all the necessary government forms (of which there are many), wrote our procedures and developed the forms we would use, and “cold called” to get our first customers. I was diagnosed with breast cancer in the early summer of 1997. The next months were filled with surgery, chemo, and radiation treatments. In between, and even in my hospital bed, I was still researching our client requests and generating sales proposals. By 2004, I was running the business myself. It was daunting, but I looked at it as a challenge. I would now get to do things “my way”, and by this time I figured I had learned a lot about how things were being done and in what direction I wanted them to go. I would also have to say that with age comes reflection. I am now in my 50's and I have found myself looking back and marveling at how much I have learned…and how far I still want to go! Entrepreneurship will Teach You a lot about Small Business and about Yourself! "Tweet This"
I cannot do everything. I have to be willing to ask for help (in business and my personal life), delegate, and outsource when needed. The best decision I ever made was to outsource my taxes to a qualified accountant. I don’t do my own taxes, so why would I tackle my business taxes? I have found that once I start a task, I need to see it through to completion. Let’s face it, something else is always going to come up. Procrastination is not an option! This one was hard for me. I tended to multi-task to the point that I was unsure anything was getting my “best”. Now, while I still multi-task, I try to give the really important jobs my undivided attention. Any Small Business, especially when trying to establish itself, needs to keep ruthless track of expenses and invoices. You need to identify what you can afford and what you cannot. Operating costs, including everything from utilities, internet, advertising, and even down to office supplies, need to be built into your budget. The importance of “Building Relationships” before “Selling”. With my venture into Social Media, this one has become even more important and, for me, the most rewarding. I truly enjoy building relationships with current and potential customers. This also goes hand in hand with great Customer Service. The more my clients trust me, the more they trust my service. To Value my Time and Charge Accordingly. Probably one of the hardest things to put a true monetary value on is your time. 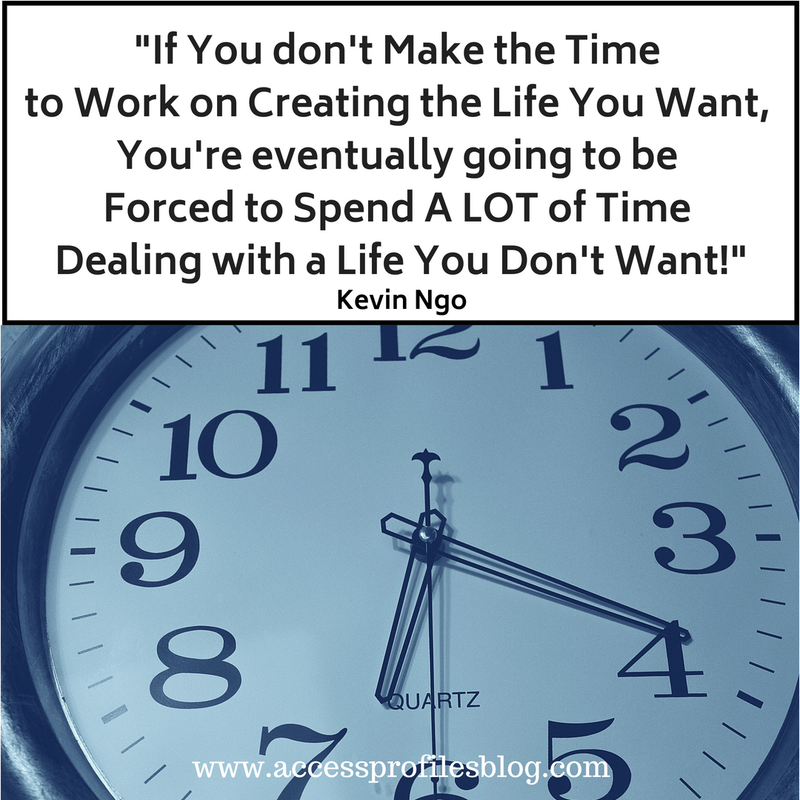 Much of my business is time – the time it takes to do research, the time to contact and verify resume information, and the time necessary to generate reports. I have been able to find a way to take my time into consideration while still keeping in mind the economy and my client’s needs. It is a balancing act, but worth it. Discover more about how I learned to set our prices in "Find it Difficult to Set Your Prices? You are not Alone!". This does not mean I am not happy with my business, it just means that I am constantly in pursuit of new and better ways to do things. In that vein, I really dived into Social Media. I have a Facebook and Google+ business page, joined groups on both LinkedIn and Facebook, and of course I have this blog. I even started Business Mentoring services. I think this re-energizes me and keeps things fresh! I Need to Plan Downtime. When you own your own business, the temptation is to always be “on the job”. This does not work. While there are times you will probably have to work long past regular business hours, you need to be able to take a break. I have found being able to take time and enjoy my family, read a book (I read every night before I go to sleep), and laugh with friends, enables me to tackle my work tasks with a better attitude. Find out more tips to help you get the downtime you need in "It's Vacation Time! Are You Ready to Break Away from Your Small Business?"! I Learned to LOVE What I Do! For me, to really be successful, it is necessary to be invested and interested. By keeping in mind my goals and being willing to adjust and adapt, I am constantly challenged (in a good way) and proud of what I have accomplished. I covered this topic more in "I Know Why I do What I Do!". So, what would I say to anyone thinking of starting a Small Business? Take the plunge…and I think you will be happy you did! Please Pay it Forward and Share This! Leave a comment too, we would love to hear your story! About Us and our Background Investigation, Business Mentoring, and Security services! Subscribe to Our Blog too! “You need to identify what you can afford and what you cannot.” You’re right. It is essential to keep track of what you’re still capable of availing with your set budget. This way, you will not fall short and you can avoid having debts. Another good thing a business should learn to be successful is to value its marketing. A well-advertised business can effectively charm its target market, and make them loyal customers/clients. You are spot on when you mention Marketing Kevin! Whether your marketing is through Social Media or traditional channels, it is definitely essential to get your name "out there" and create a brand. Thanks for your comments and I appreciate you taking the time to read my blog article! If you are interested, I invite you to read some of my other articles on small business also - and you can subscribe if you would like. Thanks!